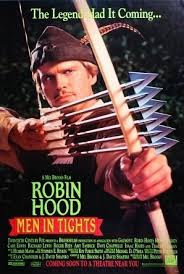 “Robin Hood: Men in Tights” is a parody of the Robin Hood movies, particularly “Robin Hood:Prince of Thieves” (1991), starring Kevin Costner. “Robin Hood: Men in Tights” is about Robin Hood (played by Cary Elwes) returning to England--now under the rule of Prince John (played by Richard Lewis) and the Sheriff of Rottingham (played by Roger Rees)--after the Crusades. Robin sees the destruction of England under the new rulers and decides to start a rebellion against the prince with the help of his friend Ahchoo (played by Dave Chappelle), Little John (played by Eric Allan Kramer), and his loyal blind servant Blinkin (played by Mark Blankfield). “Robin Hood: Men in Tights” is is an incredible comedic film complete with very funny gags and modern day references.